Yesterday my 8-year-old discovered that the stalks of romaine lettuce leaves were hollow. Immediately she peeled off the rest of the leafy matter, got a glass, and started sucking up water through her new lettuce straw. 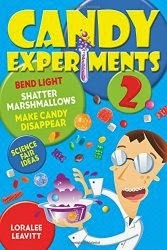 I guess it only counts as a candy experiment if, like my daughter, you think lettuce is sweet, but it was really fun. We've turned candy canes into straws by pulling out the middles, and now lettuce--wonder what other foods would work?